The Global Retail Industry will surpass $25 trillion sales this year, a staggering amount, which is perhaps only put into perspective when you realise that this is 10x the UK GDP. The UK Retail market is worth £400 billion and employs 3 million people, around 10% of the UK workforce. Whilst blockchain is commonly known as the technology that enables Bitcoin, its potential far exceeds this. I gave a brief explanation of blockchain technology in a previous article and outlined an introduction to retail blockchain in a follow-up post. 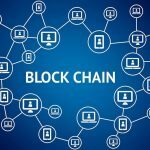 This article is an in-depth look at the specific aspects in retail that will be affected by blockchain. Before we start delving into the extensive list of areas that will be disrupted, we should perhaps pause to reflect on the core ethos of blockchain technology. That is that it is intended to be a decentralised entity, devoid of control or influence by single authorities. The ideals of libertarian peer-to-peer transactions come before the profits of the corporations. Reality often fails to correspond. Blockchain applications in a retail environment will deliver 4 main benefits; Reduced Costs, Faster Payments, Increased Transparency and Improved Security. These will be achieved through several core technologies, working in tandem and/or alongside each other. 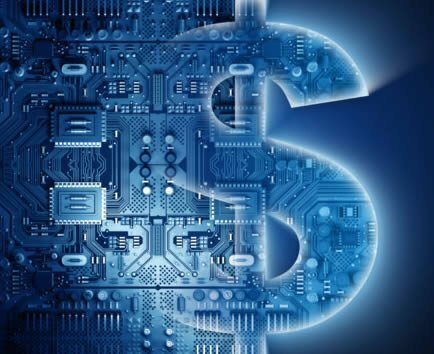 Cryptocurrencies, distributed ledgers and smart contracts will vastly increase the speed at which transactions and settlements are concluded, cutting out vast layers of administration, reducing costs and making every Retail CEO smile (we do that when we save money). A blockchain is a method of securely recording data on a database that is shared across a network of computers (distributed ledger). Once a record has been validated, it’s added to the block (ledger), after which it cannot easily be changed. Rather than being stored on a central server, the data is distributed across the network, resulting in no single point of control, or failure. Blockchain emphasis is placed on decentralised peer-to-peer transactions. So let’s turn to how blockchain will help retail companies deliver these converging challenges and discover how blockchain will disrupt retail. This guide is a quick Top 10 list to provide a brief introduction for fellow retailers interested in understanding this emerging technology. This isn’t just about retailers accepting cryptocurrencies as a method of payment, sure Overstock, Expedia and Subway grab the headlines when they announce they accept bitcoins, ethereum et al but this is about digital currency becoming the primary method of payment on the Internet. Retail payment providers take too long to settle transactions and charge too much for the privilege. Blockchain payment applications offer faster transaction settlements, at much lower fees and with better security than credit cards. If we reflect on the core ethos again, this is about payments decentralised from banks, credit card companies and even Web 2.0 disruptors like PayPal. There is also the concern over these companies benefiting from our data. 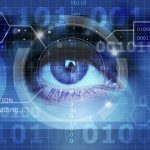 Big Data is big business and many consumers do not want to share their personal information, whether this being direct transaction data or anonymised tracking statistics. Blockchain applications allow consumers to take-back control of their own data. In a similar way, retail payments to/from suppliers, whether goods or services, can be faster, cheaper and more secure. A supply chain built into a blockchain using smart contracts enable payments to be made immediately upon the contract criteria being met. In other words, as the warehouse receipts the stock, invoices are paid within minutes, rather than in days, weeks or even months. Impact on initial cashflow is offset by the significant reduction in administration costs, which some have estimated to be upto a 90% reduction. The reduction in administration can be realised by all interested parties, which may lead to lower prices as suppliers feel the benefit of lower operational costs. Retailers utilising cryptocurrency as a method of payment, are unaffected by fiat currency exchange rates (GBP to Dollars, Euro to Yen etc), assuming both parties trade in the same digital currency and that no currency exchange takes place. 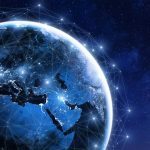 This can be applicable for both consumer payments and supplier settlements, eliminating the huge cross-border FX costs across the retail industry, and the associated admin costs. Given the current price volatility of cryptocurrencies, we perhaps have a way to go before this establishes itself as the currency of the Internet. Many retail companies provide their eCommerce customers with the option to purchase goods via a retail loan, using the services of companies like V12 Retail or Barclays. These consumer loan options have comparable interest rates to banks and credit cards but at much higher fees to the retailer. Peer-to-peer loans have established themselves as viable alternatives over the past few years and now equate to over £3bn within the UK alone. Blockchain applications are well placed to capitalise on this and offer retail customers a comparable product at much lower cost. Using blockchain technology within the retail supply chain was one of the earliest applications of a distributed ledger in a practical environment. The benefits of transparency and authenticity readily led to advantages, culminating in faster payments and significant cost savings derived from eliminating administrative tasks. Blockchain technology allows for the authenticity of raw materials, such as proof of Fair Trade and Organic goods. It also allows for the authenticity of source, giving a much needed boost to combating counterfeit goods. 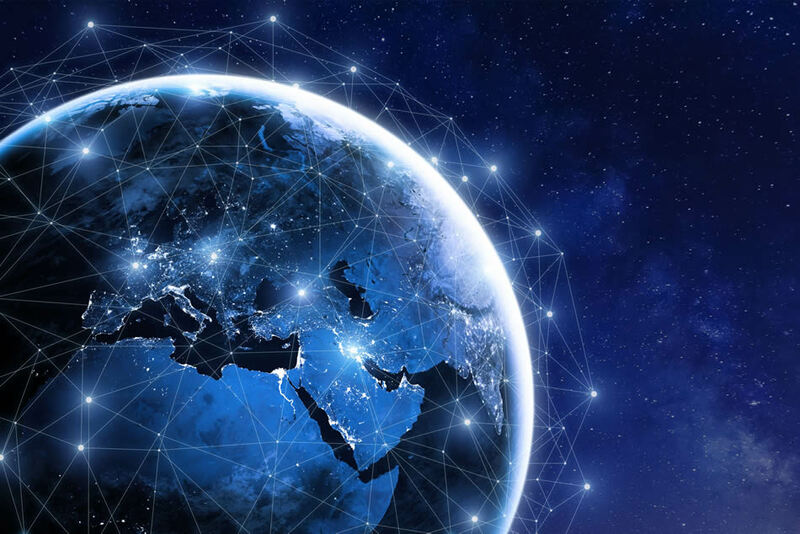 Whilst Blockchain provides extensive benefits in the retail supply chain, the combined effect of distributed ledgers and complimentary applications like RFID and IoT, explodes the scale of opportunities beyond our immediate comprehension. Retail companies adopting blockchain within their supply chain include Walmart, Alibaba and IBM & Maersk who track goods using the Hyperledger Fabric platform. This may lead to the elimination of customers’ age-old question, “where’s my order?”. The Resale market is huge, eBay alone generates $10bn annual revenue. It is therefore unsurprising that it attracts unsavoury actors who look to profit from unsuspecting consumers. Whilst many of the goods sold in these marketplaces are genuine, many will be counterfeit. The immutability of a blockchain provides for the authenticity of ownership and proof of original supply source and/or materials. Secondary markets for concert tickets is one area of concern for many people, with resale of tickets changing hands for many times their original face-value. Blockchain technology can help eradicate this problem and provide rights owners with a tool to set undisputed rules governing how ticket ownership may be initially established and also resold. 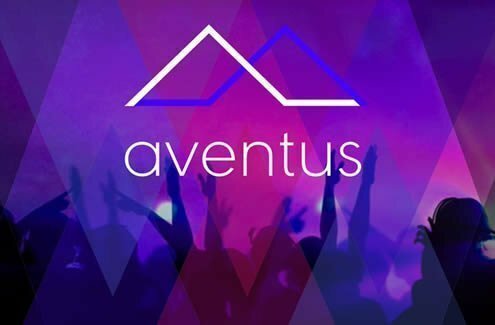 The Aventus Protocol permits rights holders to define rules across the ticketing supply chain which must be adhered to by promoters, venues, agents and ticket owners. They do this using smarts contracts built on the Ethereum blockchain, thus providing an open audit trail for provenance, integrity and compliance. On Sept 4, 2018, Amazon became the second company after Apple to cross the $1 trillion market capitalisation threshold. Its sales last year were $178bn and are growing at around +40% each year, resulting in a 45% US market share. Its Asian doppelganger, Alibaba, has equally dominant statistics. Revenue last year grew by +56% to $23bn and it has almost 60% market share in China. These eCommerce giants are dominant to say the least, too dominant. These behemoths are in complete control, of both individual consumers and retail companies utilising their marketplace. However, there is inadequate KYC (know your customer), which allows sellers to hide behind masks of anonymity. As Amazon et al become even more dominant, we are left dependent on them and chained to their demands. From a retail perspective, the merchant fees range from 7% to 20%, of the inc vat sales value, equating upto 24% margin points. At a time when retail margins are at an all-time low, this leaves very little for the seller once other operational costs are taken into consideration. Against this backdrop, several blockchain-based companies are revolutionising the way retail is conducted on online marketplaces. These companies are creating decentralised platforms to enable peer-to-peer marketplaces. One example is Soma, derived from ‘Social Market‘, which is a new Blockchain-based platform that creates a digital community where users are able to buy and sell items or services through a P2P network. 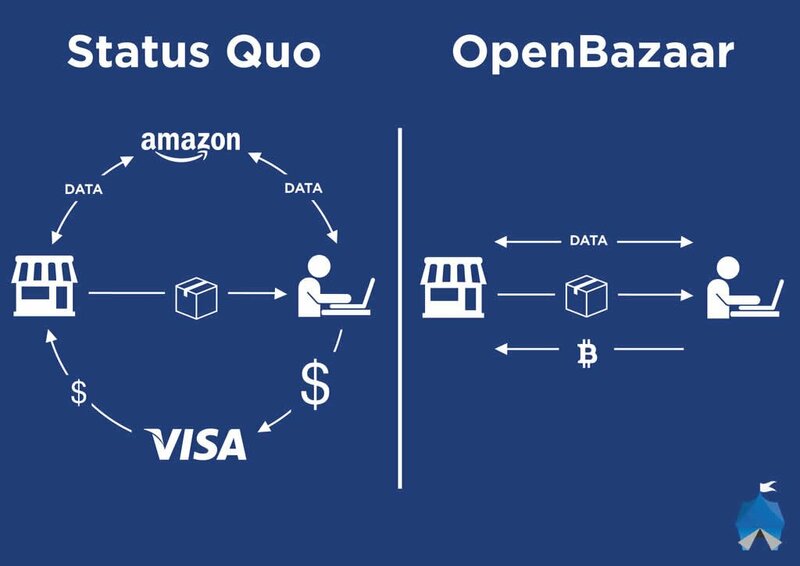 OpenBazaar is another example which builds on the foundations laid down by Satoshi Nakamoto for peer-to-peer transactions without the control of a centralised entity, resulting in an open source eCommerce platform without fees or restrictions. eCommerce is well understood and has become synonymous with Internet shopping. The term pCommerce however is perhaps less known. Around 5 years ago its general meaning was participatory commerce, in that shoppers were invited to participate in the design, selection or funding of the products they purchase. Recently its started to evolve to mean people commerce, although I prefer peer-to-peer commerce as it’s more in-keeping with the core blockchain principles. So what is a pCommerce Marketplace? It is where buyers & sellers are able to transact with each other in a direct, transparent and secure way, decentralised from any controlling organisation and devoid from any onerous fees. The recent scandal at Facebook over their association with Cambridge Analytica and the realisation that they were, in the eyes of many, abusing the trust users had placed in them, brought privacy data concerns crashing to the fore. Whilst Facebook retains over 2 billion active users, it has lost the trust of many and is losing the battle to attract the next generation of users. Whilst there are alternatives to Facebook, many are of a similar ilk and have not fully understood or adequately addressed the privacy issues and concerns. 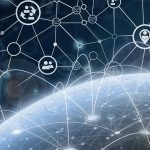 Blockchain social media companies claim to ‘champion users and truth‘ by developing platforms built on distributed ledgers to enable secure, transparent and decentralised platforms. If they get it right, and libertarianism continues to be important in society, there will be a new generation of social media networks. There are some social media platforms that have already started to establish themselves and whilst still nascent concepts, they are starting to encourage some people to rethink how they interact socially online. Some early examples include; Steemit, Sapien, Sola, Indorse and onG. If we again reflect on the core Blockchain principles and cement our thoughts on a peer-to-peer community, then we start to focus on how one-sided our relationships are with Advertisers and the online communities in which we religiously participate. The new breed of social platforms address this by rewarding users for their attention and contributions. Steemit is a blogging and social networking website that uses its blockchain-based platform to reward users for contributing quality articles and for those who curate the community by upvoting content. Rewards are given in the form of tokens, which can be traded and as such provide it with market value. Retail Loyalty & Reward programs are well established, giving reward points to customers based on the value of their purchases, which are then redeemed in a number of ways. The current schemes are perhaps too linear and are based solely on monetary exchange. However, a retailer wants, and often gets, so much more. They seek brand ambassadors, people that will like, share and contribute to the development of their brand, often via social media. Retail companies are required to follow employment law like everyone else. This requires an employer to provide new employees with a minimum set of documentation when making an offer of employment; Offer Letter, Employment Contract, Employee Handbook, Reference Requests, Medical Questionnaire etc. The key of course is to automate this and this is where applications built into a blockchain can provide significant benefits to retailers. Imagine a Smart Contract that automatically distributes the necessary documents for employment, processes new starter data like personal & bank account details for payroll, checks for receipt notifications of the employment documents, sends reference requests and then is able to perform initial checks on the responses, validates citizenship and the right to work in the UK and every other task associated with recruiting a new member of staff. This guide is a quick Top 10 list to provide a brief introduction for fellow retailers interested in understanding this emerging technology. The complete list of benefits to retail is extensive and offers retail companies a wide range of opportunities to realise the full potential of blockchain technology in retail.